After protest the offensive piece of "art" was removed. Carroll Community College in Westminster, Maryland, opened a new art exhibit called "First Contact." 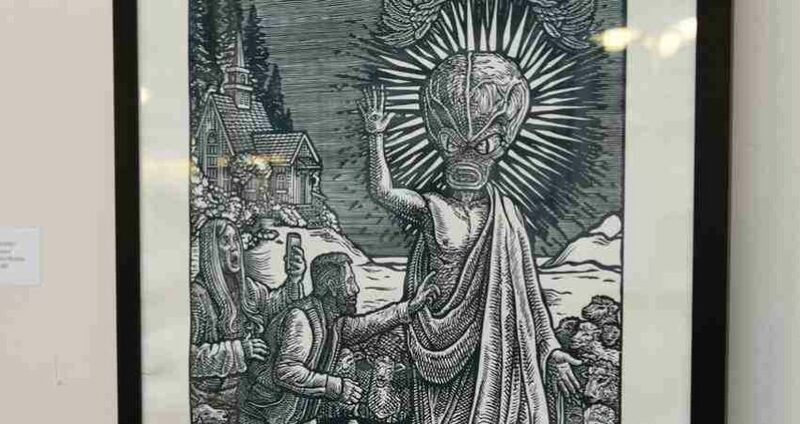 The "art" collection featured a satanic-looking image mocking the Resurrection of Our Lord, portraying a risen Christ with the head of a grotesque alien with a huge black serpent below. The blasphemous creation by James Ehlers is titled "The Skeptic, The Prophet, and The Hyperreal." While on campus, I saw first hand how the image is a twisted mockery of our Divine Savior. I picked up a leaflet about the exhibit featured in the Babylon Great Hall. "This exhibition contains some imagery that may be considered offensive or uncomfortable to viewers," the leaflet stated. Indeed, the work is a flagrant attack against Our Lord Jesus Christ, placed on display during the Easter season. Higher education? Not this. The ghastly work masquerading as “art” only demonstrated how low education has degenerated in our age of politically correct nonsense. If God is not respected, yes, even in art, how can we expect human interactions in general to be respectful and decent? With this in mind, I went into the college office to lodge my personal protest and explain how offensive the display was to me as a young Catholic. TFP Student Action also contacted Dr. James Ball, president of the college, urging him to remove the blasphemous image. If the piece was not removed, TFP volunteers were ready to organize a large peaceful protest on campus. Catholics in the local community voiced their concern as well. 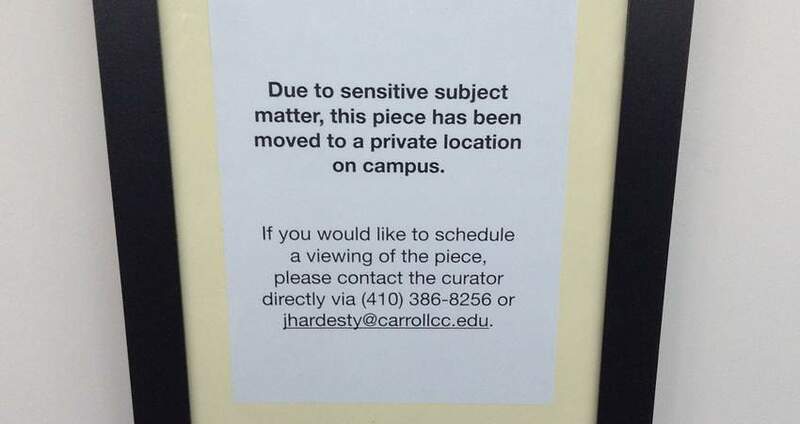 "Due to sensitive subject matter, this piece has been moved to a private location on campus." Despite the fact that the blasphemy was taken down at Carroll Community College, the "art" exhibit is reportedly scheduled to travel to other destinations. If that happens, TFP Student Action will be ready to defend Our Lord's honor and call for its removal once again. The notice that now hangs on the wall where the anti-Christian blasphemy once was.